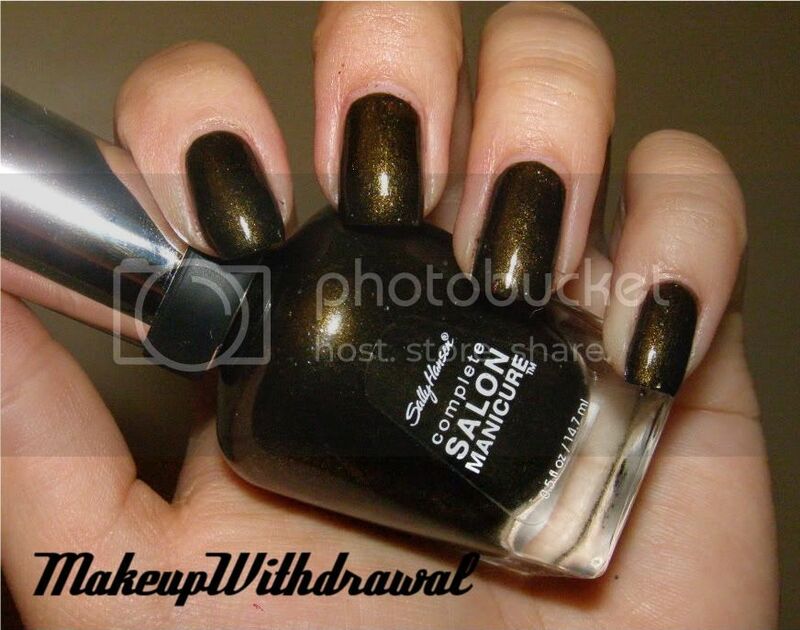 I have to warn you in advance- there's going to be a lot of posts about Sally Hansen in the near future! I stopped at Rite Aid yesterday and they had BOGO1/2 off of polishes, plus a $1 Wellness UP (basically a coupon for a $1 off your next purchase) for every enamel that you buy. So I may have gone overboard. It's not my fault! I have been looking for all of the new LE Sally Hansen polishes everywhere, and finally found them. This one is probably my favorite- Sequin Scandel. It's a very dark swampy green shimmer- with sparkle bits that aren't uniform in size so that it's very interesting to look at. Now, I don't know if I mentioned this before but I LOVE the Complete Salon Manicure bottles/brushes. They look snazzy and I actually prefer the shiny handle and sleek glass bottles to those of OPI or Orly. And the brush is so great, big and thick yet flexible and slightly tapered. I can usually cover my nail in one or two swipes. Have you seen this LE collection around? It contained a lot of brownish-khaki looking shades.